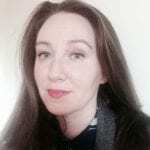 Mary McGill is a Hardiman scholar at the National University of Ireland, Galway (NUIG). Her research explores young women’s engagement with the selfie phenomenon. Her areas of interest include digital culture, visual culture, gender and (post-) feminisms. She lectures in gender and feminist theory at NUIG’s Centre for Global Women’s Studies. Outside academia – time permitting! – she works as a freelance journalist and media contributor, with a focus on women’s rights, women’s histories, popular culture and the arts. She tweets at @missmarymcgill.